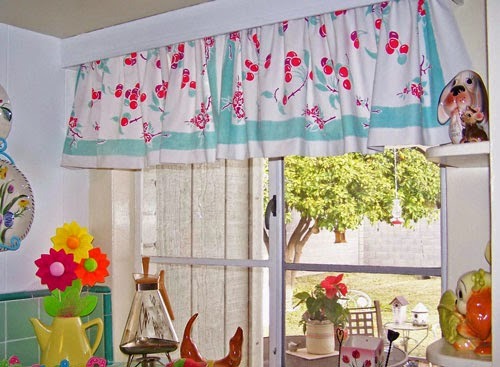 I have this plan to get curtains in the kitchen, such as the ones picture up above, instead of the blinds that are there. The blinds have been there as long as I have had the house and they are really dirty from having been in the kitchen so long, with the kind of cooking I do. They cannot be cleaned. I have tried. So I thought, curtains. I really do not need blinds, you know? I would rather have half-curtains that would block out the sight of me from outside but still let in the light from the higher panes. They would brighten up the kitchen. Howard said: "But the neighbors would still be able to see you." He said, "Well, from the upper floors." Meaning, if they went upstairs and looked down, maybe they could see me. I said, "Well, they can knock themselves out." If it is worth running upstairs to get a glimpse of me listening to Leonard Pennario and stirring things with wooden spoons and swearing at my back issues of Cooking Blight, so be it. I still want curtains. With that in mind I went to Kmart after work. I got those springy curtain rods that fit the windows without you having to screw them in. I am not a hardware store person. Kmart is a whole other story I will have to get into another time. After Kmart I went to Amvets all bright and hopeful that I would find cute vintage curtains. Alas, no luck. They had tons of bath stuff, such as those furry covers that fit over your toilet, haha. But no kitchen curtains that I could find. 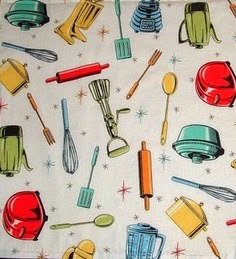 Darn, and I had such an image of cute curtains with geese and strawberries and rolling pins and whatever. Oh well. Perhaps I will learn to make my own curtains. Meanwhile I did get a great deal on a Food and Wine cookbook that I love. It is Food and Wine Herbs and Spices! Already I have made a recipe out of that book. I made Cod and Potatoes With Thyme. Try Etsy or Ebay. I tried to post a link in an earlier comment to a vintage style kitchen valance on Etsy, but it didn't post correctly. Bing, thanks, I will do that! I was thinking yesterday I should try eBay. Any excuse to go on eBay!